Truth is not relative. Several times recently, I’ve been in conversations where someone said that there are “versions of the truth.” They suggest that people can witness an event and walk away with different impressions about what happened. That is undoubtedly true. Ask seven witnesses about a car accident, and you’ll hear seven unique stories based on different viewpoints, focus, attention, and participation. Each will be nuanced by that viewer’s unique perspective. Still, that’s not what I’m thinking about. No matter what each witness remembers, there is only one thing that really happened. In a car accident, there is likely hard evidence – skid marks, damaged autos, specific injuries – to document what took place. Despite what anyone remembers, we can tell that the car was traveling at a certain pace because it left 75 feet of rubber on the road. Even if the evidence is misleading or confusing, there is still but one true account of the event. This is very important. Truth isn’t some amalgamation of all seven stories. When people offer different versions, that doesn’t mean the truth lies halfway in the middle. The truth is what happened. Versions of the truth aren’t the truth. No matter how sincere, well intentioned, or credible the witness, the truth is still the truth. Versions are a lot like opinions. Everyone is entitled to an opinion, but not all opinions are created equal. Some are passionate, some are informed, and some are self-serving. Some are reasoned and accurate; others are laughable and ridiculous. We might be amused by Paris Hilton’s opinion about the New York Stock Exchange, but most of us aren’t going to bet our retirement on it. Just because she’s entitled to an opinion doesn’t make it accurate or helpful. There may be ‘two sides to every story’ but that doesn’t mean both sides are equally right! There are two sides to World War II, and two sides to the Proclamation of Emancipation, and – even – two (dubious) sides to the Christian Crusades. Just because someone claims something doesn’t make it true. Or even close to the truth. People remember different things. They may offer different versions because someone was distracted, or momentarily absent. Or, in the cases of attorneys and politicians, someone gets paid to spin a particular version of the truth. Maybe there are different versions because one person is lying. As a society, we’ve been trained to be tolerant. We try to listen to everyone. We focus on being open-minded, and acknowledge people’s freedom of expression. We even allow a presumption of innocence when we catch someone red-handed. Versions play a part in all that. Still, when all is said and done, the truth is the truth. The number one question we get here at the Family Investment Center is this: "How much do I need to retire comfortably?" 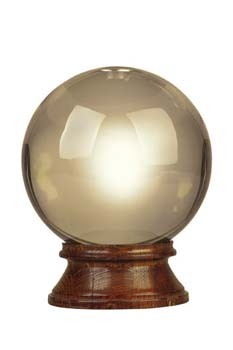 Of course, our crystal ball is in the shop, so it's difficult to answer. Make that impossible. No one knows - and it depends on many variables. 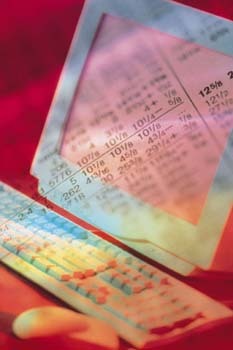 So, some folks search for retirement calculators and rely on those for calculations. This is limited, of course, and really doesn't help in the long run because often, these caculators are far from accurate. We ran across a good article by Mark Miller on Retirementrevised.com that explains how the calculators work, what the shortcomings are and how to find better alternatives. Of course, a solid plan with a fee-only financial planner, such as the Family Investment Center, is the best way to go. Don McNay writes pieces for The Huffington Post, and this week, he addresses the Goldman Sachs hearings. He's right when he says that we'll be no closer to knowing the truth about Goldman Sachs when Congress is done with grilling company executives. Congressional hearings sound impressive, but they don't solve problems or get to any real truth. What Goldman Sachs did sounds un-American. Just remember: investments are always buyer beware. A good fee-only investment advisor could save an investor from buying into something this crazy. Investors are the true long-term architects of family wealth accumulation and preservation. They are a special breed who utilize the availability of professional investment management, and have the constitution to stay with the plan, even when it appears all is lost. All is never lost, of course. Investors intuitively understand that a retrenchment in asset prices is the time to be aggressive, not to capitulate. Investors understand the importance of saving. Investors know that short-term moves in the market (up or down) are primarily noise, sentiment or whimsy, and have little to no bearing on the long-term value of equities and the businesses they represent. Warren Buffett describes the stock market in the short-run as a “voting machine.” Popular sentiment, psychology and herd mentality (good or bad), can drive stock prices to amazing bubble peaks and gut-wrenching price nadirs. Neither is fundamental or real. The long run investor understands this, and remains true and loyal to his plan. It is much easier on mind and spirit to be an investor in prosperous times, than in tumult. The scientific approach to the building of wealth, as embodied in Modern Portfolio Theory, has been proven the most reliable strategy for investors since this break-through approach captured headlines and professional interest in the 1950s. Unbelievers bounce in vain from strategy to strategy always seeking a better built mousetrap, and some succeed in the short run. Our social makeup in the information age requires near instant gratification. Those who “play the market” move like a stampeding herd, always chasing the tail of out-performance, but never quite able to grasp it. In our own myopic and self-interested view of the world, we want to be unique and special. We believe that this time is truly different. We believe in a new normal of some sort or another. Yet, business marches forward. Equity prices ebb and flow in the near term for many reasons: news, politics, taxes, earnings, war or tranquility. Business television will run a split-screen when a powerful person, such as President Obama or Chairman Bernanke, steps to the podium. Words are spoken, the Dow Jones vacillates, and commentators link the two together painting a picture of the short-run just as Buffett’s voting machine suggests. The fact of the matter is that the short run is just as unpredictable as it appears. Daily volatility, a reaction in stock prices to an event or series of events, seems understandable when the experts explain how good or bad news caused a positive or negative reaction in the markets. We accept these notions because the human mind wants to longs for certainty. No investor on earth knows precisely when a bear or bull market will start and finish without benefit of hindsight. Thus, the most prudent strategy with the highest probability of success is to stay properly diversified and invested, using the proven approach of Modern Portfolio Theory, all of the time. Attempts to time the market invariably result in disappointment. Behavioral finance observes that people logically want to buy when times are good and sell when times are bad. When implemented, this strategy results in buying the market peaks, and selling during the dips – exactly the opposite of family wealth building behavior. This week on Twitter, we're providing home improvement tips. Your home is your largest investment, and you need to care for it both for that reason and just so you can enjoy living in it a little bit more. CNN has a great article today about the buying process that lists six mistakes people make that can cost you during the purchasing process. Here's a link to the article. Read through it and make sure you cover all your bases next time you're buying a house. This book was recommended by Dodie Jacobi, a respected business consultant in Kansas City. She suggested that it offers great insight into the social media environment, and is an easy read, too. If you own or work in a smaller business those are magic words: helpful and easy. I bought Crush It! that same day. I read it the next weekend. I agreed to “lead” a discussion on this book blog because Dodie was right. Gary Vaynerchuk is a compelling character. His story is unique and wonderful. He used social media and other resources to crash one of the most exclusive parties in the business world – the wine industry. His fresh approach, enthusiasm, sincerity, and (yes) charisma allowed him to jump multiple rungs of the success ladder. That’s what any of us want, right? And his story is not just about marketing, either. I know my way around marketing, and another marketing book isn’t necessary for my personal library. Gary’s approach blends both life and business lessons, along with a bit of Zig Ziglar or Dale Carnegie. 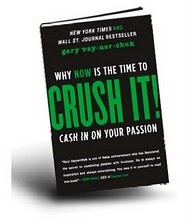 Why Now Is The Time To Cash In On Your Passion is the book’s sub-title and Vaynerchuk clearly thinks that’s the important theme for success. Now, the business implication is that social media and networks create the perfect opportunity to live your passion. Whether it is wine, motorcycles, or personal finance (to randomly select a few! ), there is a community of like-minded people seeking expert commentary. And, since you are passionate about it, you can find an audience. Eventually, that audience can be lucrative enough to pay your bills. Chapter Two’s lesson is that our personal uniqueness is an asset. I really enjoyed this chapter because Gary talks us through his personal story. In some ways, it’s the perfect American tale, from immigration at three years old, to eventual status as “Social Media Sommelier” (ABC News) and Wayne’s World Wine Aficionado (nightline). Like most success chronicles, it’s a great story and it makes fun read. Chapter Three is – in many ways – the essence of this book. “Developing your personal brand is key to monetizing your passion online.” In the author’s case, that meant offering truthful information about wines in easy-to-understand terms. If you’ve ever browsed a wine store or bought a traditional book about wine, you understand how refreshing that is! You also understand why Gary Vaynerchuk has become so successful. The point is that almost everyone has similar opportunity. We all care about different things and we all bring unique perspective to them. And we all have the ability to communicate that perspective in a variety of ways. We can write, talk, act, speak, or even create original art to share our message. And, if we are passionate enough and work hard enough, we can prosper because of it. We'd love to have your thoughts on this great book. We've started a second blog for dicussion of business-related books, called Beyond the Bookshelf, and you can find it here. Please click on the link and comment there (same post content) if you'd like to tell us what you think about Crush It! 1. Think about a successful person you know. In a few words, what is his or her passion? 2. How about Bill Gates or Warren Buffett? Again, in a few words, what separates them from others in their field? Describe their personal brands. 3. How does the Steve Jobs personal brand differ from Bill Gates? 4. If you achieved international success as a businessperson, how might people describe your personal brand? Our Facebook Fan page describes what we do as “Family Finance Evangelism.” I guess that makes me a family finance evangelist! • Financial success is a personal choice and responsibility. • Financial success requires family savings. • Financial success requires wise investment choices. • Financial success is enhanced by a family stewardship team. Personal choice and responsibility: We all know people who enjoy privilege of talent or birth. Most of us don’t. The amazing thing is that it doesn’t really matter much without a sense of personal responsibility. Alternately, we all know people of modest means who achieve remarkable success. Success is mostly a matter of choice. Family savings: Distant family goals require money set aside today. If every dollar flowing into a home flows right back out again, it’s not there for education, retirement, or other crucial goals. Success requires regular and systematic savings. Wise investment choices: There was a time when this wasn’t so important. Today, the time distance between saving to spending can last a half-century or more. Retirement dollars invested at 30 have to buy medicine when we are 90. Invest wisely to serve long-term family purposes. Our role as investment advisors is to help people achieve pesonal and family objectives. We don’t know all the answers and we can’t predict the future. But we can help people discern the path most likely to help them achieve family goals. There is both art and science in what we do, but it’s all we do, for hundreds of families and clients. The Merriam-Webster dictionary uses the phrase “militant or crusading zeal” in their definition of evangelism. That’s my point today. There are four key beliefs that are most likely to help people achieve family goals. I’m a Family Finance Evangelist. My zeal is to help people succeed. It takes four principle beliefs. 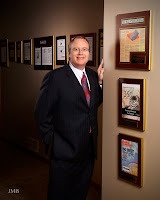 Dan Danford regularly provides a podcast for Dad's Divorce.com, a web site for men going through the divorce process. Here's his latest podcast, which answers a question from a listener: I have never had a job with a 401(k) or much money left over for savings. I'm worried about having enough money to live off of when I retire. What suggestions do you have for planning for retirement? It's good to look back, and that's something I always recommend, and endorse. Our own Jason White is offering this great reflection on the first quarter of 2010. Have a listen and post in the comments what YOU think. We answer questions here from followers of our Twitter feed, @family_finances. If you have a question, please post it in the comments section or e-mail it to robynsekula@sbcglobal.net. QUESTION: On the NPR radio program Marketplace Money last Sunday, the financial experts were discussing setting a target for when to sell an investment, such as if it drops 10 percent in value, or if it rises 10 percent in value, so that investors don’t hold on to an investment too long. If you’d like to do that, what percentage would you suggest? And should the percentage be the same for an investment that’s dropping as one that’s rising? ANSWER FROM DAN DANFORD: This really depends on the kind of investing you do. If you own individual stocks, then having some targets is helpful. Generally, you want to buy stocks when the price is low, and sell when it's high. A stock is actually a portion of a company, and the value is determined by financial things like revenues, assets, and profitability. But different people have different estimates of those numbers, so two informed people can have different estimates of value. An analogy I sometime use is a house. We can both visit a house and agree that it is a spectacular house. We'll agree on the square footage and building materials and the size and quality of the lot. 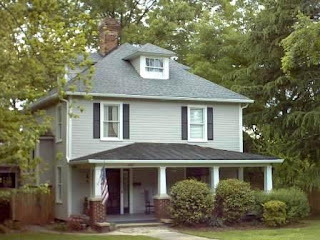 We can gather information on other, similar houses, and even the level of mortgage rates. But, still, we can reach different conclusions on the house's value. Even if we agree on the exact value, we might argue over a smart purchase price. Let's pretend for a second that the house is "worth" $200,000. Would you pay $300,000 for it? How about $225,000? If you could grab it for $150,000, would you? Stocks are kind of like that, too. Just because a company is good (or even great) doesn't mean the stock is a smart buy at a particular price. The true value is a moving target, and sometimes the stock will sell for less than value. Other times, it's selling for more. A good stock picker will buy when the price is lower than estimated value, and sell when higher. That sounds easy enough, but it's harder than it sounds. Now, the idea behind price targets brings some structure to the process. You estimate value, then create a band around that price. When the stock moves one way or the other, you take action. If you were wrong in estimating value, a low target will reduce your risk. You can limit your losses by deciding where to sell before you even buy. On the other hand, a high price target forces you to take profits when they occur. Perhaps this takes some of the emotion out of decision-making. Having said all this, I'm not a big advocate of picking individual stocks. It takes an incredible amount of time and most people can't do it well enough to beat the markets anyway. For most folks, a low-cost index fund will produce better results with less effort. Diversification also reduces risk, and funds do that better than any other option. We use funds in managing million-dollar portfolios, and that's probably the best approach for your IRA or investment account, too. The best thing that can be said about pricing targets is that they require some forethought about your investments. Too many investors buy the hottest stock or fund without enough thought about the overall strategy or purpose. People focus on the trees, instead of the forest. I'm for anything that brings thoughtful deliberation to investing. 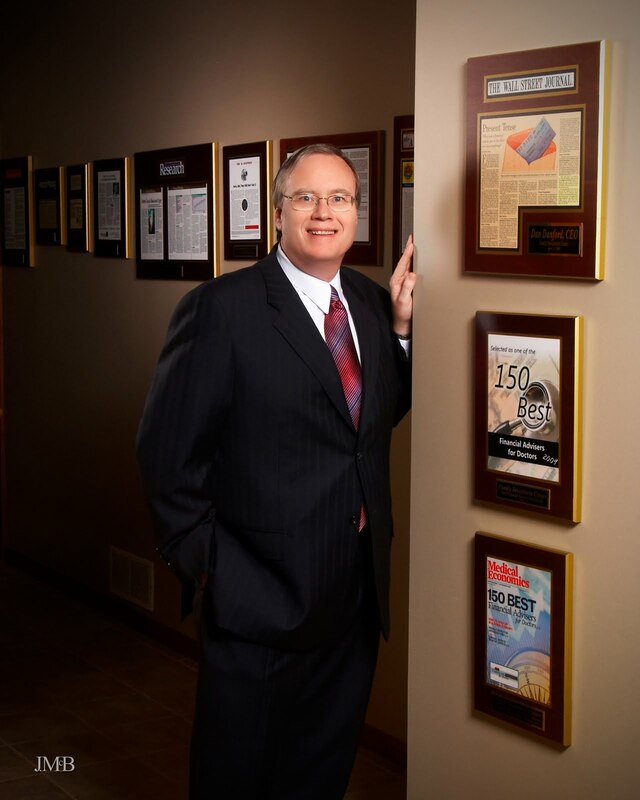 In my most recent column for the Maryville, Mo., newspaper, I discussed the scientifically-proven, Nobel prize-winning method of investment management known as Modern Portfolio Theory (MPT). I use this time-tested approach religiously in managing about $60 million of client investments. From a macro point of view, MPT has just two goals: maximize return and minimize risk. This is a tricky benchmark. Most of us recognize that risk and return are highly correlated. The more risky a particular investment, the more return investors demand as compensation for that higher risk. While this relationship is sometimes hard to see in investment management, it is readily apparent in consumer finance. Let’s take mortgages as an example. Low risk borrowers, those with high credit scores, good salaries, reasonable levels of debt, long employment history, etc., borrow money at the lowest market interest rate. These borrowers are low risk, thus lenders earn a relatively low rate of return on loans to them. Consider a second borrower who is a credit nightmare. High risk borrowers may be past due on credit card and other debt service payments. They may be unable, or unwilling, to hold down a job. They have low FICO credit scores. Maybe they have even declared bankruptcy previously. Intuitively, we know that the second borrower is going to have to pay a much higher mortgage interest rate than the first, because there is a much higher level of risk associated with the loan. The same risk and return characteristics can be observed in the market. Utility stocks, often referred to as “widow and orphan” investments because of the lower risk level associated with them, have smaller but steadier returns than a biotechnology company or a wildcat oil speculator. So, in MPT investing, we rely heavily on the idea of asset diversification to maximize return while minimizing risk. We want to spread dollars across various market securities to develop a balanced investment “scorecard.” We want to own bonds, stocks and real assets most efficiently by using mutual funds. A general rule of thumb for the average risk tolerant investor is to own a percentage of bonds in his portfolio that is equal to his age, with 20 as a minimum and 80 as a maximum. Thus a 40-year old investor would allocate 40 percent of his portfolio in fixed income mutual funds and/or individual government, agency and corporate bonds. Another 10 to 15 percent of the portfolio should be in diversified holdings of international stocks and bonds. These should be mid-to-large size firms in countries that do not have excessive political risk. For example, I am much more comfortable with a Brazilian firm than a Venezualan one because of the political risk from Hugo Chavez. About 5 to 10 percent of the portfolio should be in real (commodity) assets like real estate, precious metals and natural resources. The remaining 40 percent or so goes into diversified stock mutual funds. For our 40-year old average investor example, about half of the stock investment should be in an ultra-low cost S&P 500 index stock fund, with the remainder actively managed in the mid-size and small-size company space. I like to use managers who blend both value (bargain-hunting) and growth (momentum) strategies. There you have it. A broadly diversified portfolio spread over multiple asset classes in safe markets all around the globe. Modern Portfolio Theory is the investment strategy that never falls out of favor! I just came from a Missouri Western State University press conference where they announced initial AACSB accreditation (Association to Advance Collegiate Schools of Business) for the Craig School of Business. That’s a huge milestone because it puts a business degree from Western on par with some of the best in the nation. The business school has really come a long way since I graduated in 1978, and even further since my father did earlier that decade. Only 600 schools worldwide share this distinction, and they include Duke, Harvard, Stanford, and Yale. It’s testimony to quality faculty, students, administrators, and community members. Everyone in our community can be proud, and it’s one more proof of Western’s commitment to quality education. Other programs are similarly recognized nationwide. I walked out of that press conference with Ted Allison, Executive Director of the St. Joseph Area Chamber of Commerce. Just this morning, I received their monthly newsletter announcing stellar performance in their periodic review. In fact, the U.S. Chamber awarded a 5 Star accreditation, an upgrade to their highest possible score. Again, it’s a remarkable accomplishment by another high-impact local group. I don’t think we do a very good job of recognizing achievement in St. Joseph. I can’t put my finger on it exactly, but it just seems to me that we shrug off success. People do something really great, and we stifle a collective groan. Maybe it’s the Show Me thing, or maybe we’ve just become jaded by narcissistic folks who claim a false greatness. Or maybe anyone else’s excellence highlights our own insecurity. Whatever it is, it’s too bad. Excellence is as rare as Haley’s comet or George Brett’s baseball swing. Excellence is – by definition – an uncommon and noble thing. It should be celebrated. We should take inspiration from unusual success (wherever it occurs) and attempt to copy it in our own lives. As a community, we should see it, applaud it, learn from it, and apply it to our own circumstance. Heartland Health, our local hospital system, was recently named a winner of the Malcolm Baldrige National Quality Award. Honestly, that’s one of the most prestigious awards in the whole world. I know they are justifiably celebrating out on Faraon Street, and later with a group in Washington, D.C. Every one of us should share that pride right along with all their employees and administration. Just to keep the record straight, I’m not a Heartland board member or even especially close to the organization. But, come on, folks, we’re talking the Malcolm freaking Baldrige award! Let’s give credit where credit is due. In these brief comments, I’ve noted three St. Joseph groups who achieved remarkable success in recent weeks or months. Excellence, even. They make us all look good, and our community should find appropriate ways to see, applaud, learn, and apply. We’ll all be better for it. Excellence is a very good thing. Really. For the record, again, I am treasurer of the St. Joseph Area Chamber of Commerce and proudly serve on the Missouri Western State University Board of Governors. And I welcome excellence wherever I find it. Don't get us wrong: we like free markets. Capitalism is good, if not great. We believe it's how most of the wealth (if not all) is made in America. But there are some sectors of our economic system that need some regulation, and unfortunately, the financial industry is one of those. There is now a proposal to create a new federal watchdog group that will (probably, we say cautiously) help consumers. The House of Representatives and Senate still have to negotiate and create one bill that can be passed that will address the need for financial regulation. If this passes, it could prohibit big pay-off fees often charged when high-interest mortgages are paid off early, and also allow consumers to go to court when they disagree with a credit card company, rather than be forced into mediation. Should I invest in China? QUESTION: Looking at international stock, it appears that companies in China are going strong. I’m wondering if that’s a market I should consider as an investor. Are there mutual funds that specialize just in China? Or should I look at individual stocks in China? Or is it even wise to concentrate in one country? ANSWER from Dan Danford: International investing is one facet of a well-diversified portfolio. There are multiple ways to accomplish that, and you mention several. I'll get back to that in a minute. Remember, though, that any investment "idea" is already factored into market prices by the time you hear it. By the time you read something in Money magazine, or the local newspaper, it's been circulating in investment circles for a very long time! That means that smart money has already acted on the idea, and it's likely that prices already went up as a result. The time to buy a really good idea is before prices go up. Go back and read those articles again: I'll bet one "proof" of their idea's worthiness is that prices have already risen. That should be a warning sign, not a buy signal. That's why market timing doesn't work very well. Our suggestion is that you build a well-diversified portfolio - including China and other foreign countries - regardless of current news. That way, you'll be buying some segments before investors drive up the prices. Over time, this approach accomplishes solid returns with less risk. A good international mutual fund will already own some Chinese investments, along with promising companies around the world. If you choose, you can buy Exchange Traded Funds ("ETFs") that specialize in certain countries or regions. Check out iShares at www.iShares.com for detailed information. Again, though, we'd suggest that you build a diversified portfolio, and not attempt to time the various international markets. ETFs tend to be index funds, so you may choose a no-load mutual fund with an accomplished manager. We like Scout Worldwide (UMBWX) right now. Buying any particular international company is risky, indeed. The usual company risks are augmented by a few others. Currency risk, political risk, and international trade risks, to name a few. Best to leave this to expert international fund or index managers. Don't forget that many U.S. companies draw considerable profits from sales in other parts of the world. Some professionals point out that the S&P 500 (large U.S. companies) has a strong international component. Many large companies here are genuinely multi-national and owning them already adds an international flavor to your portfolio. Retirement plans that include employer contributions usually fall into three categories: 401(k), which covers most people who work, 403(b), which covers those who work for non-profis, and 457 plans, which applies to many people who work for government entities. For the most part, these plans work the same way, but we thought we'd take some time here to call your attention to recent changes in 457 plans. They have some particular rules that govern how they work and you need to pay special attention to these rules if you are investing in a 457 plan, particularly if you're getting close to retirement. You can make some catch-up contributions to 457 plans, but there are certain ways it has to be done. If you need a quick primer, here's a great article we found on Investopedia, which is a terrific resource for people who need help with financial terms.